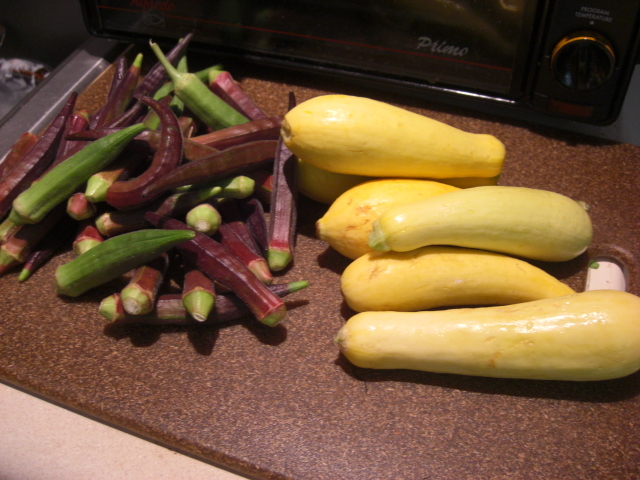 6/29 Beets, okra, squash, blueberries, and nectarines! This week, I wish I had the room to take a picture of my whole CSA order. It was so colorful. Instead, here are the individual pictures, which you can combine into a CSA collage in your mind. 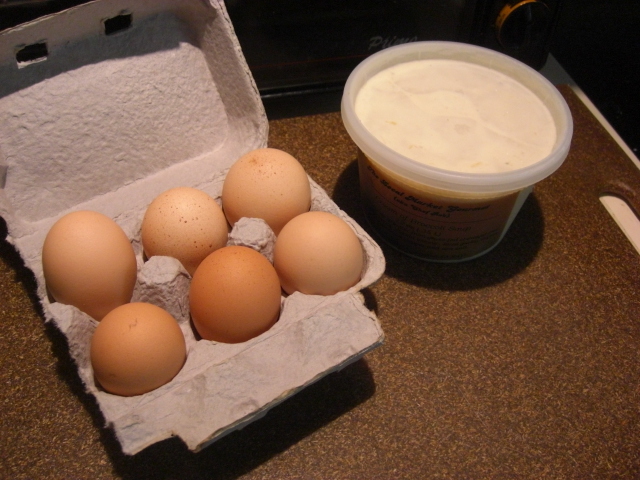 Along with some local goat cheese, these two make an awesome salad. I’ll roast the beets and chill them. 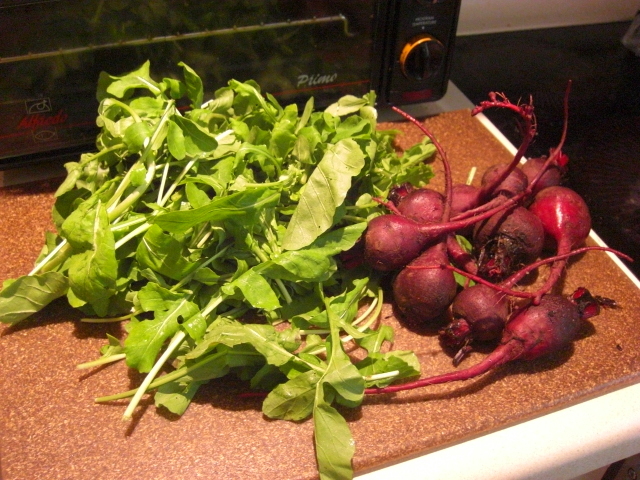 Then I’ll slice them and add them to the arugula along with the cheese. No salad dressing required, although a sweetish vinaigrette applied with a light hand is nice. This is the prettiest okra ever! I should probably do something besides chop, bread, and fry… nah. This week we’ll have fried okra breaded with flour and some Riverview Farms corn meal. I like veggies fried in plain old, non-virgin (less pricey) olive oil. So tasty! The squash will get sliced, breaded, and fried, too. Maybe not deep-fried, though. Something more like this. If we don’t eat all the squash fried, it’s easy enough to add to casseroles and stir-fries. I went ahead and sliced two of these guys because the ends looked a little mushy. See what I mean about all the color? 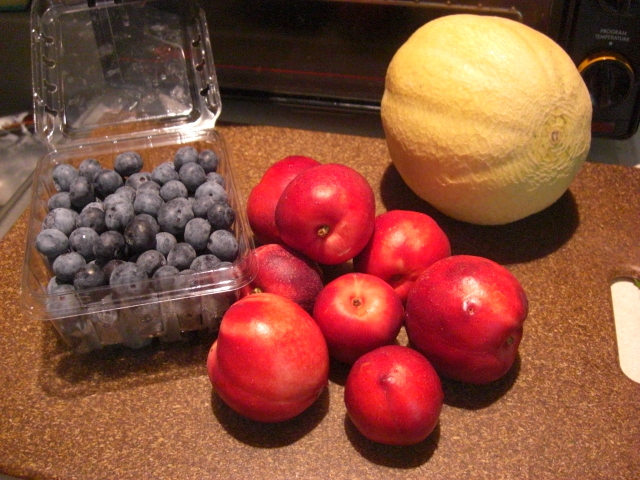 These fruits are so pretty and smell so good. We’ll snack on the blueberries or possibly freeze them for later snacking, baking, and pancake-making. I’m thinking the melon will get chopped and thrown in the blender with some ice and rum. I was never really a fan of melons until I discovered this summer night trick! 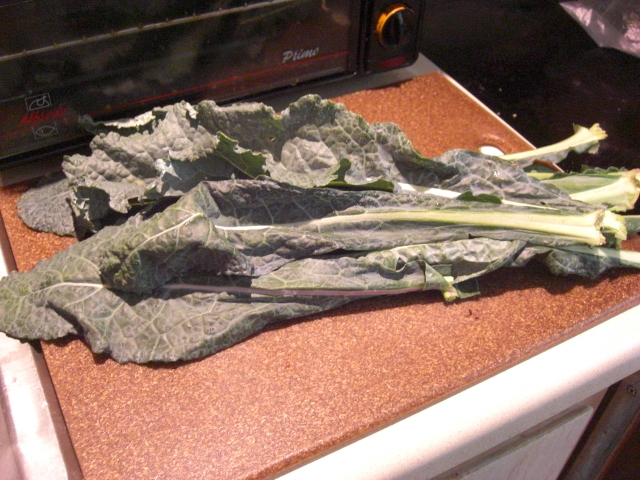 This kale is most likely tonight’s supper sautéed with chopped pecans and raisins. Yum! We were smack out of eggs, so I’m super-happy to see these guys. For the soup, I’m going to think outside the bowl and use it in a gritsy risotto. 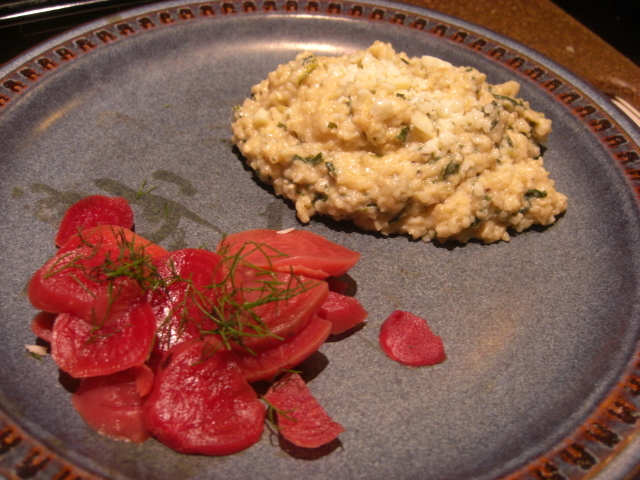 Last week, I found that you can use grits instead of rice when you’re craving something risotto-y. I sautéed the grits briefly in olive oil with sliced leeks and then cooked them with some water and chicken broth for about fifteen minutes. In another pot, I combined some cream cheese, Romano, chopped blanched spinach, and more broth to make a sauce. Then I added the sauce to the grits and let it cook down a few more minutes. So I’m thinking of doing the same kind of thing, but using the broccoli soup instead of cream cheese and broth. I’ve also got some broccoli stems to throw in the mix. Possibly some yellow squash, too. Make it a veggie casserole kind of thing. Depending on how it tastes, I might add a little white wine and lemon juice to the sauce at the end.